ScaryLetter.com brings you a new kind of horror fiction: a story which takes the form of a terrifying letter, mailed to you. It is available as an ebook or a personalised paper letter mailed to your home. 1) PAPER EDITIONS: personalised, physical letters which are snail-mailed to your home address, or the home of a loved one! Each is created by the author and unique. Order early for Halloween 2013. Check out the Paper Editions page for full details. 2) EBOOK EDITIONS: low-priced ebook. 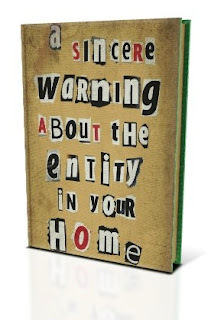 Check out the Ebook Editions page or jump straight to the Amazon UK or Amazon US pages to check out A Sincere Warning About The Entity In Your Home.